Create your own Metal Earth Praying Mantis. The carnivorous preying mantis is born with sharp spines found on their front legs. They use this to hold their prey so that they can devour them. One of the interesting things that this insect can do is it can rotate his head 180°. 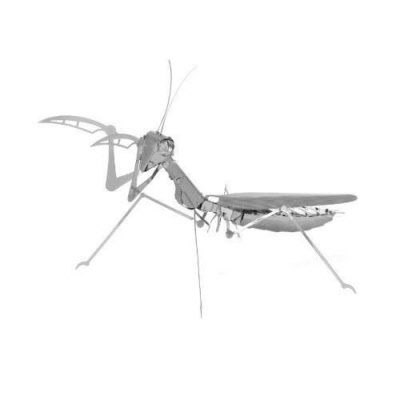 Another fun fact is all preying mantis only have one ear. These guys are so strong and fierce that they can even capture large hummingbirds. The name comes from the Greek word meaning prophet because they appear to be praying when their forelegs are clasped together, however, don't let them fool you. Recommended for ages 14 years and up. Incredibly detailed model from laser cut metal sheets. The Metal Earth® models are amazingly detailed etched models that are fun and satisfying to assemble. Each model starts out as 4 inch square metal sheets and you simply pop out the pieces and follow the included directions to assemble your model.